Sedum, Wild Flowers or Grass for your roof? I always wanted a living roof on our studio. It was the one thing that was non negotiable. The whole structure was based upon the calculation we needed to be done for the roof, to be able to take the weight of the roof. I can stress enough how important this is. What you can have on your roof will depend on your calculations for its loading. In parts of Europe roofs are calculated as standard with a snow loading calculation to make sure that the roof wont collapse. 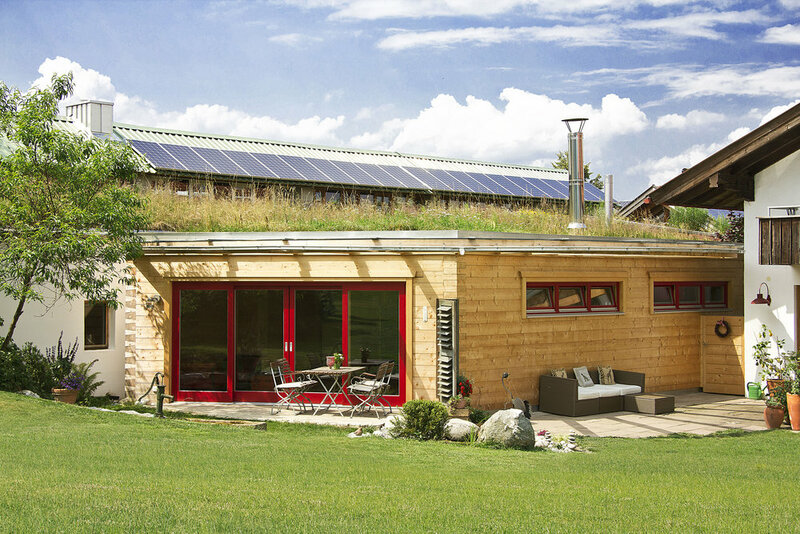 A living roof can be heavy, especially when it is wet and this MUST be calculated for when considering a living roof of any kind whether its sedum, grass or wild flowers. When that bit has been sorted you can then think about aesthetics. Each option comes with its benefits of beautiful bursts of colours of each wild flower or the bronze and fiery Reds of the Sedum in the autumn and grasses will look the same all year round for consistency. The second consideration may be bio diversity. Living roofs create habitats for insects and provide a valuable food source as well as contributing to the production of oxygen. Obviously all will provide a habitat and oxygen but the wild flowers will provide more of a food source, especially for our increasingly threatened Bees. Another consideration is one of maintenance. A sedum roof will need weeding once a year as tall weeds will stand out on a otherwise relatively low roof covering, whereas any weeds on a wild flower roof will become part of it. This may also be a problem if you opt for a turf roof or ornamental grasses. Some systems will require more watering in draught conditions. Sedums are the best at surviving this but I still give mine a water if its not rained for a bit to be on the safe side but this would completely depend on how big the area is for watering. Each system should be fed in the spring and I always use chicken poo pellets as a great food source for my roof in the springtime! See my other blog for details ! Lastly your final consideration is one of cost. There are many options available and some are more costly than others. If you have the patience to look at soil for a bit and wait for your roof to establish itself from young plants then the cost will be much lower than if you want the ‘big show’ of a wildflower turf or sedum matting, which comes as a roll, which you just roll out on top of the water retention/drainage layer that you have put down first. The last option, which is the most costly is the modular tray system which you simply just place on top of your roof. There is no ‘best system’ its just weighing up what will look best for your budget, remember though that the one thing that you can not budge on is your roof loading. If it hasn’t been calculated for it don’t use it. The weight of any living roof on top of a roof, which hasn’t been designed to take it is extremely dangerous. If you are not sure ask a structural engineer to take a look.